StencilPro™ uses UV light to transfer the design onto the film by blocking the UV from hitting the emulsion. Where the UV hits the emulsion it begins to harden, so when StencilPro™ is exposed to any UV the exposure begins. What are the settings for StencilPro™? . . as you have probably already have in mind what light source you are going to use (so you'll know your distance) and now need to know how long for? Below is the manufacturers guide to get you started. To see our real life tests results (pic's where available) click here . .
StencilPro™ 25 sec. 16 sec. 3 min. 2 min. 5 min. 3 min 10sec 11 min. 8 min. 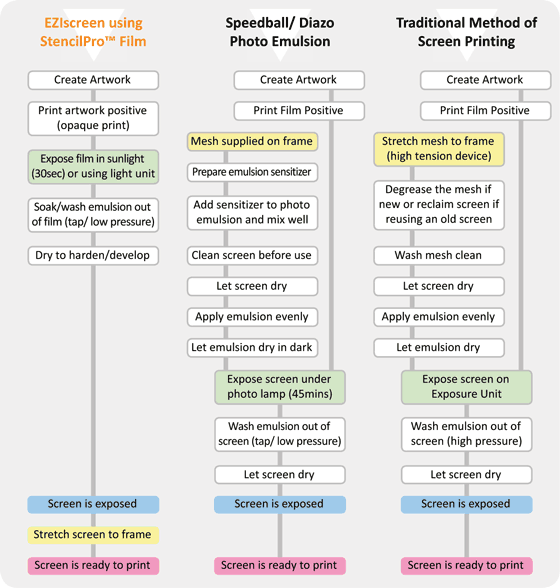 The chart below quickly details the steps involved, what's not show is the massive time savings StencilPro provides - hours per screen as there is no emulsion coating or drying making it much faster than emulsion systems. Speedball screen coating and exposure details are all over the Internet, however one of the easiest to understand articles is on ehow.com - click here . .